Port Hedland was the next stop after 80 Mile Beach. It’s a strikingly industrial town to a visitor. About the first thing you notice are huge glittering crystal mountains, with a conveyor belt cascading more onto the top – the salt works. There are square miles of salt pans around here, clearly too salty for mosquitoes because we didn’t notice any. 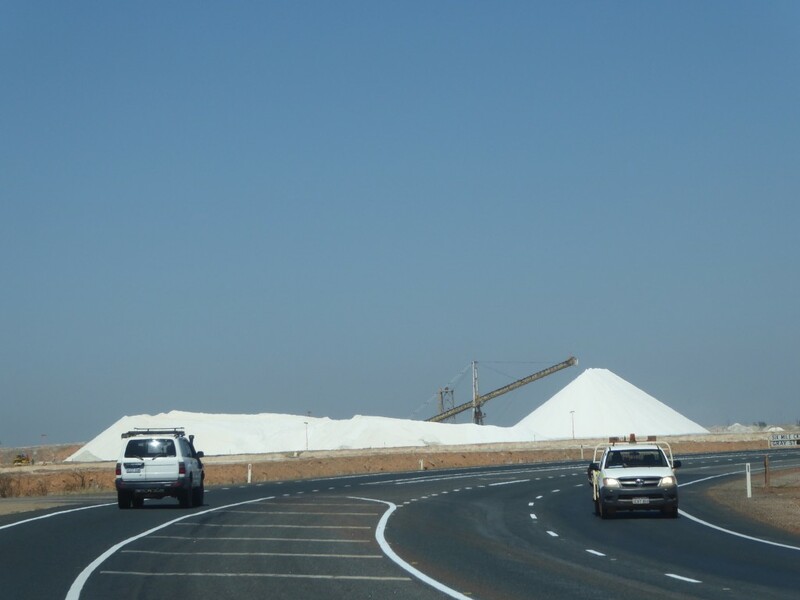 As well as producing industrial salt, Port Hedland is an industrial port, so there are cranes and heavy machinery everywhere as you drive into the centre of town. South Hedland is where most people live and where the shopping centre is located. 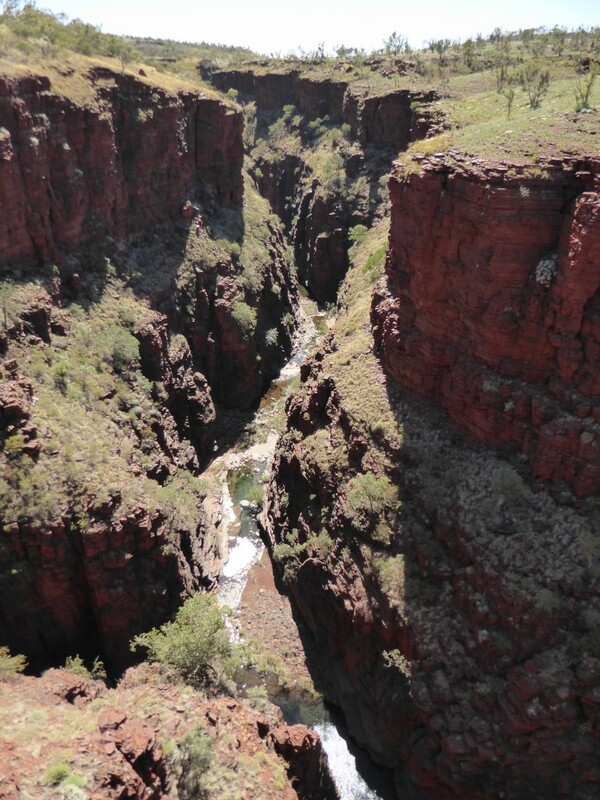 The drive out to Karijini from Port Hedland is daunting. 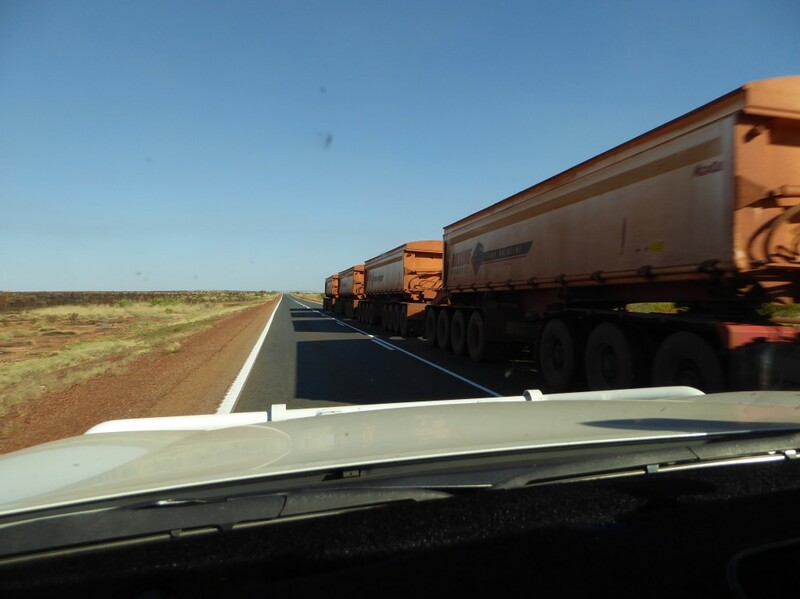 There are more heavy mining trucks on the road than anything else, all pulling a body and three trailers. But they’re well-mannered and indicate to tell you when it’s safe to pass. 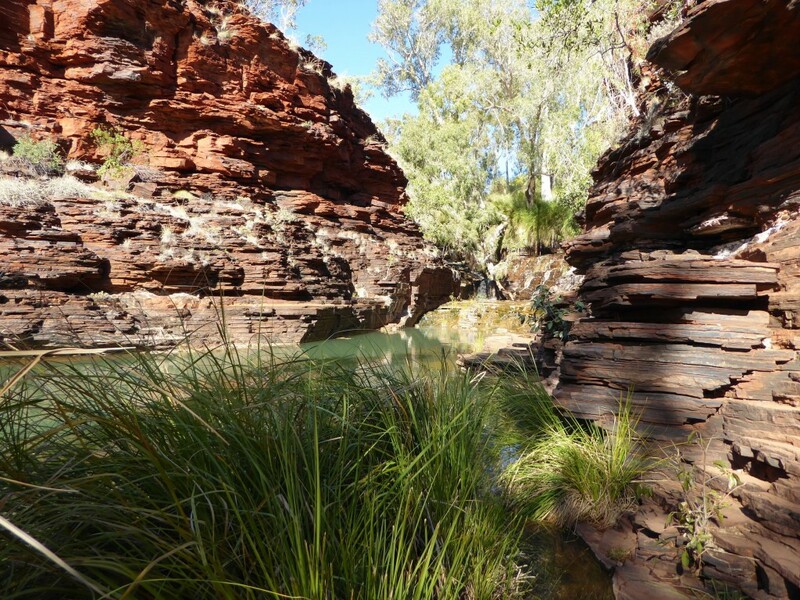 At Karijini, we were thoughtfully given a tent site where we had a chance of hammering our pegs into the hard ground – volunteers staff the campsites and organise the camping. They’re retirees who bring out their own caravans and stay a month, helping run the park campsites. A great idea! 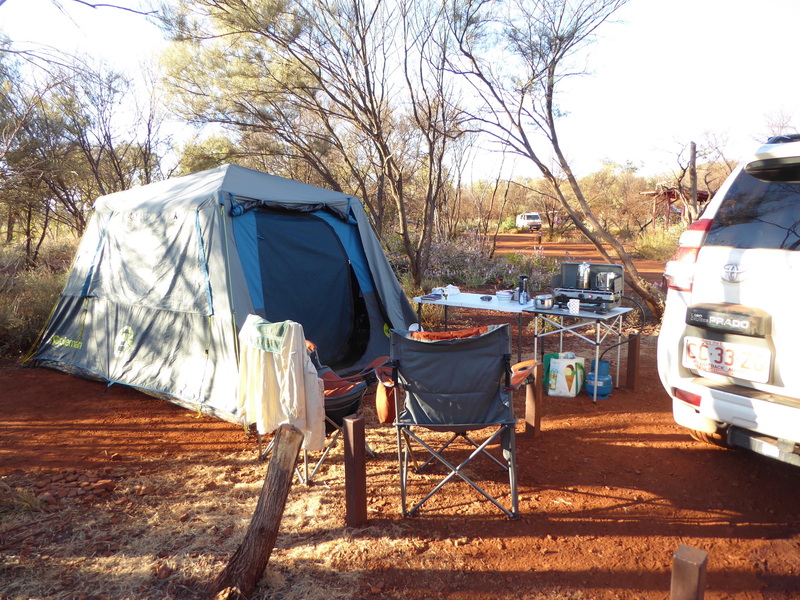 It’s bush camping – no water so no showers, just very efficient long drop toilets. What is it about a hole in the ground that attracts human beings? Maybe it’s the danger element. 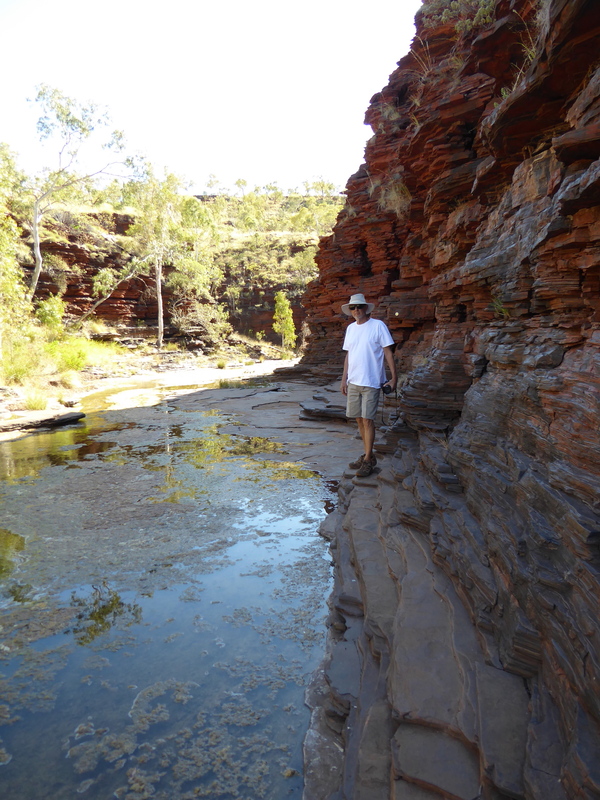 These gorges are amazing – they are much deeper than I’d expected, and as a bloke said to us in PH – “you wouldn’t want to be stumbling around in the dark in this country, these gorges just suddenly open up in front of you”. And they do! 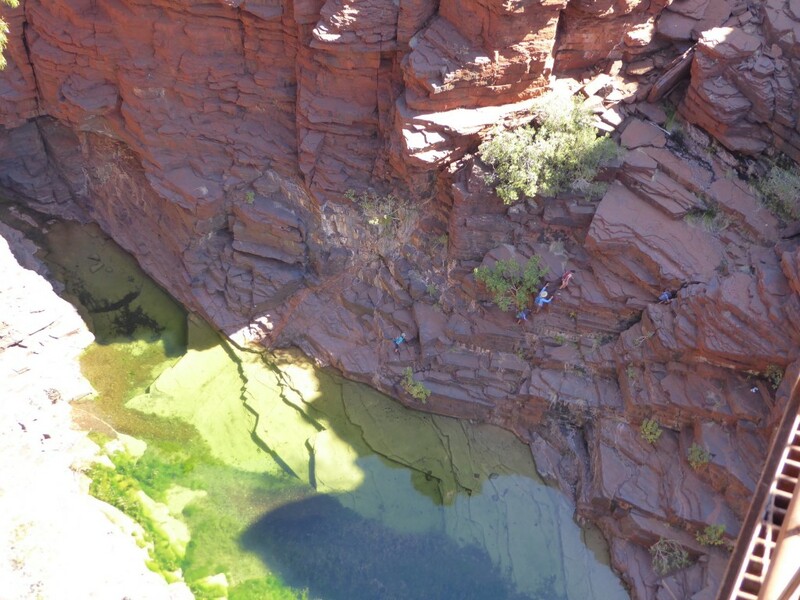 You drive to the gorge, and walk over to a little fence, and there it is, hundreds of feet to the bottom, straight down. Absolutely breathtaking, and beautiful. Paths follow along beside most of them, not fenced at all. Natural selection can do its work unhindered. It worked for me. Discovered a fear of heights combined with crumbly vertical goat tracks…and stayed topside mostly, I’m ashamed to say! 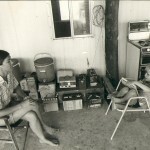 Tom Price was a place I heard a lot about growing up. I think the mining boom was hitting its stride then. And I’m sure it was called Mount Tom Price. Perhaps the mountain was made of iron ore, so now it’s just plain Tom Price. It’s a pretty little town to reach after travelling through a lot of hard red country. Green and tidy. 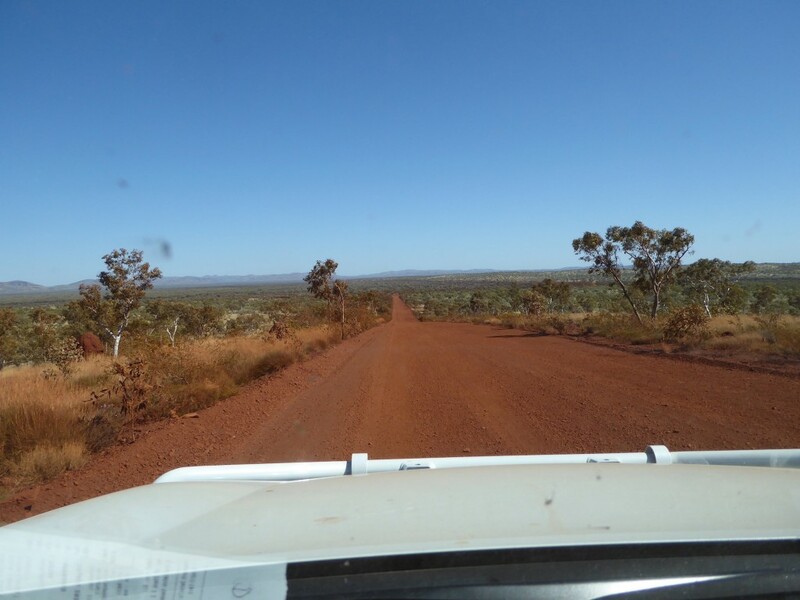 We avoided the crowds lining up for the Rio Tinto tour, and headed for Onslow via the shorter gravel road. Not another vehicle the whole way, and through some majestic country. Next stop – the jumping, jiving metropolis of – Onslow! How fun to see your blog….. I am glad you two are still having adventures. It looks really beautiful. Love to you both!